[BDT026] is our first single track release featuring a wicked tune from none other than the one like Sevin! Fast becoming one of the most often mentioned producer and getting noticed by Drum&Bass fans everywhere, Sevin's beautifully arranged, moody and jazzy deep vibe filled tunes are being supported by some of the biggest names in Drum&Bass scene today. Sevin brings us yet another immaculate work displaying the depth of his compositions in “Troubled Mind”. Give it a listen and you will become haunted by the sounds of this self-described "just another guy expressing himself". 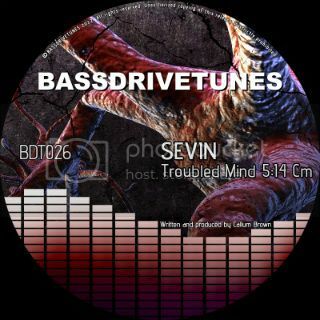 [BDT026] Sevin - Troubled Mind is OUT NOW and only available exclusively at http://tinyurl.com/BDT026! Help us help this great producer get back up to speed by purchasing this great tune!!! I like what you guys are up too. Such intelligent work and reporting! Keep up the superb works guys I’ve incorporated you guys to my blogroll. Secure your teen and child with Parental Control app and monitor your child all mobile activity For more Details Click Here.